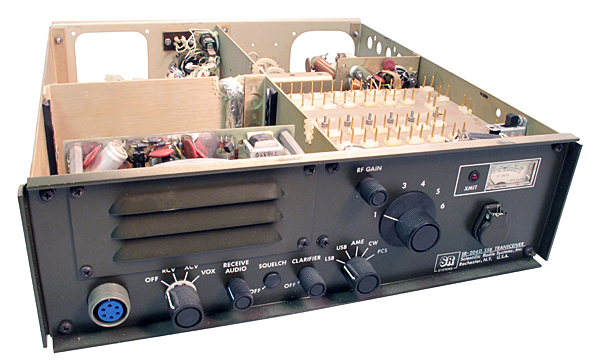 Harris RF-110A amplifier. 2 kw, 2 - 30 MHz. 75 mW drives to 1500 watts out. Pair 4CX1500B. 19" rack mount. New, factory seal on unit. NOTE: Does NOT include power supply. Includes instruction manual (copy). Harris RF110-A Amplifier ancillary kit. 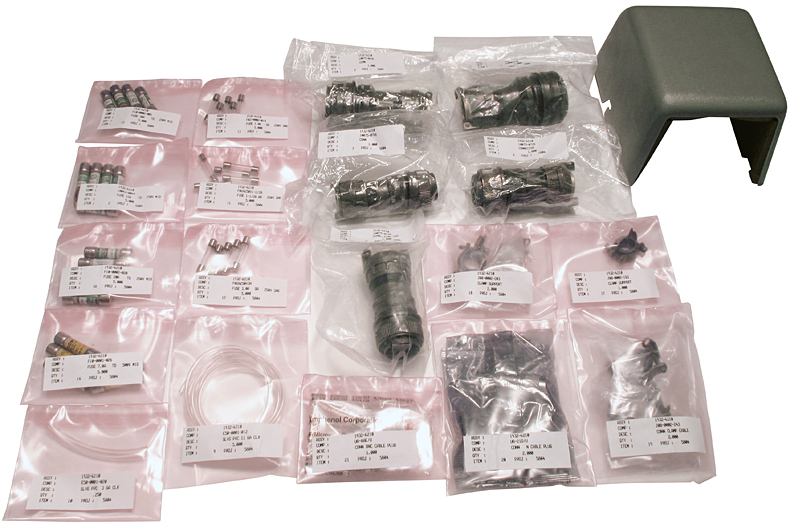 Accessories include 5 circular connectors, fan noise silencer, fuses and more!! NOTE: Sold only with our RF-110A amplifiers (above). Ventilated bottom cover included. No top covers available. A full manual for the SR-204 is included with each unit. VHF/UHF RF deck. Push-pull. 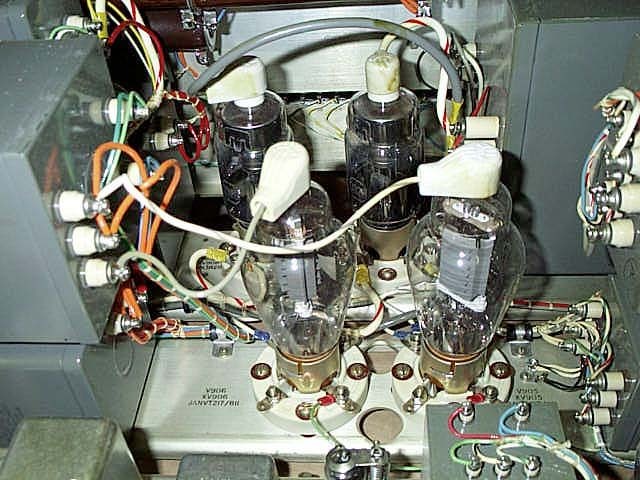 Eimac 4CX250K air cooled tubes (Includes 2 4CX250K and built-in coaxial sockets. Link coupled input and output circuits with air variable capacitor tuning. 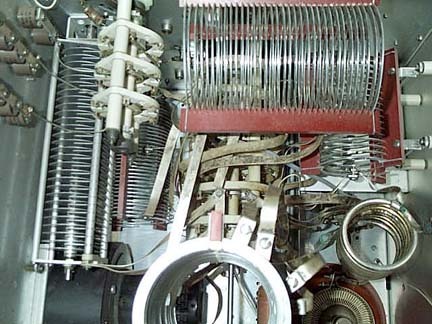 Worm drive on capacitors for precise tuning. Covers 220 to 400 MHz. "BNC" input connector, "N" output. Made of 1/16" and 3/32" silver plated brass. 6-3/4" x 9-1/8" x 6-1/4". 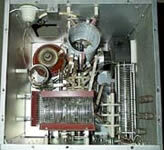 Removed from AM-1365/URT amplifier. • Plate Transformer: Freed 30994, 115v, 45-60 Hz primary // 2540 vct 400 madc secondary. Measures 6" x 7" x 7" high. Hermetically sealed. • Filament Transformer: Freed 30993, 115v, 45-60 Hz primary // 2.5v @ 10 amps secondary. 1050v high pot. Measures 2-3/4" x 3" x 4" high. Hermetically sealed. • Modulation Transformer: Freed 31001, 18k ohm center tapped primary // 165 ohm secondary. Drives plates of (2) 811A's. 80 watts. Hermetically sealed. • Plate Choke: Freed 30997, 4 Hy @ 400 madc, 35 ohms DCR, 1350v high pot. Measures 3-1/2" x 4" x 6" high. Hermetically sealed. • Swinging Choke: Freed 30996, 6-12 Hy @ 400 - 100 ma, 40 ohms DCR, 1964v high pot. Measures 4" x 4" x 5-1/2" high. Hermetically sealed. 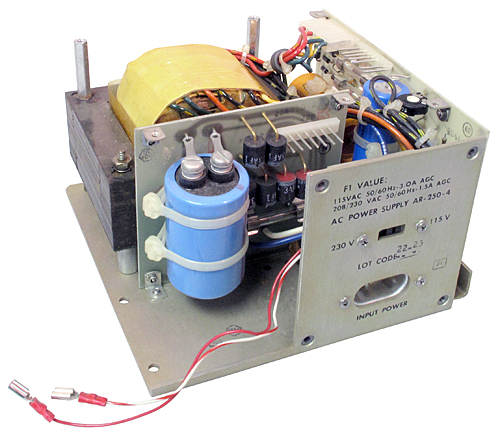 • Filament Transformer: Freed 30999, 115v, 45-65 Hz primary // 6.3 vct @ 8 amps and 6v @ 1.5 amps secondaries. Measures 3" x 3-3/4" x 5-1/2" high. Hermetically sealed. • Impedance Transformer: Freed 31002, 8 kct @ 50ma to 2500 ohm ct @ 50ma. Measures 3" x 3-1/4" x 5" high. Hermetically sealed. This Mackay Marine linear amplifier seems to be in very good condition. 19" rack width, 24" deep, 21" high. Missing top and bottom covers, 2 knobs and 4CX250 driver. Long wire output. Sold as-is. No power supply. 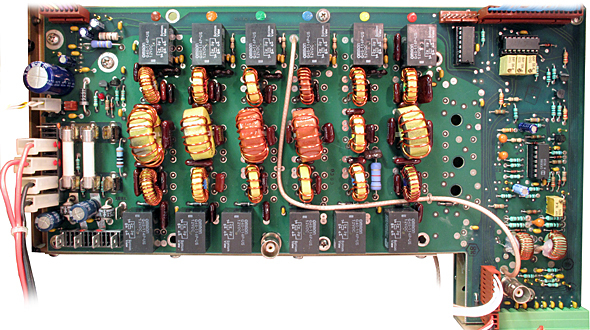 Scientific Radio Systems RF decks for the SR-110 Kilowatt Amplifier line. These complete decks were ready for insertion into the 3' standard rack. Will produce legal limit with a pair of 3-500Z's (not included). Just add the power supply and go. 10 channels completely preset and auto-tuned as operator makes selection. Each channel can be set for separate ham band, with bandwidth to boot. This is a premium quality commercial / military product and not a cheap imitation. 19" wide (rack mount), 21" deep, 17" high. Brand new!! Optional power supply below. (1) B&W Model 802 Plate Choke1) Complete manual compliment for finished equipment "SR-110" in English, French or Spanish! Beefed up version of the SR-110, this amplifier outfitted with high capacity blower, chimneys, extra internal ducting and an extra internal fan. Side and top panels included. Everything you see above plus a pair of factory installed / tested Eimac 3-500Z triodes. 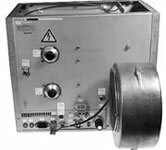 Scientific Radio Systems RF decks for the SR-210 / SR-240 Series of Transmitter. All final tested and ready for insertion into chassis. They plug together. Just add input and output tuning and you're ready to go! Ten card edge sockets at top of picture show SRS input boards. Available separately for $45 each. Power supply weighs 18 pounds. 6-1/2" x 8" x 5" high. RF deck is 8" x 8" x 6-1/2" high. Brand new! Great building block for QRP Linear Amplifier. Milliwatts drive to full output. Full manual and schematic documentation included with purchase. Required to tune the tube stages of the amplifier. Low-level stages are broad-band, no tuning required. Use up to "10" input boards. Some boards not complete but parts are included. Control panel view (back?) of amplifier. Verniers control air variable capacitors. Also shown are blower, in/out N connectors, voltage input terminal block. 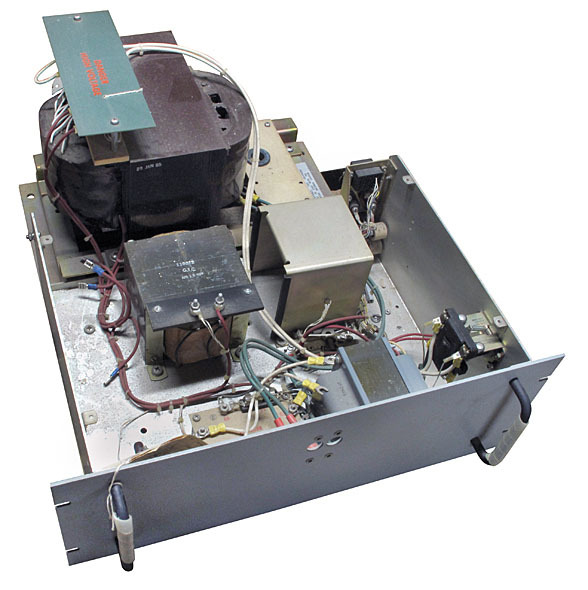 These amplifier decks are removed in A-1 working condition from medical imaging equipment. Will produce legal limit with 4PR-1000A (included). Just add power supply and go. Add capacity / inductance to get down to 10 meters or decrease capacity / coils to get up to 6 meters. Uses highest quality components. 19" wide (rack mount), 10-1/2" deep, 16" high. Made in Germany. * Draloric PD70 ceramic capacitors rated at 16 amps RMS. PD100 rated at 25 amps. Mullard JP9-2.5 Magnetron with WR-90 output. Scientific Radio Systems SR-110 Kilowatt Amplifier's shown in stand-by and main mode, side by side. This 48" cabinet has empty area as pictured for exciter, originally to be an SR-380. RF deck and power supply final tested with Eimac 3-500Z's at factory and ready to go. Sold in 1996 for $11,000 each. Brand new!